Rachel Jane Nicol was born in Little York located in the northwest corner of Warren County IL. Although not much is known about her family, her mother was Susan Giles Nicol, and she had at least three brothers. Rachel lost quite a few loved ones as she was growing up. Her father died when she was around 16, her younger brother died during the Civil War, and another brother died in the Mississippi. Her oldest brother William became an established farmer. A cousin of Rachel, Matthew H. Jamison, wrote a book of recollections throughout his life, and one chapter was written solely on Rachel. From the title of the chapter, it is clear that there is some controversy in her official name. 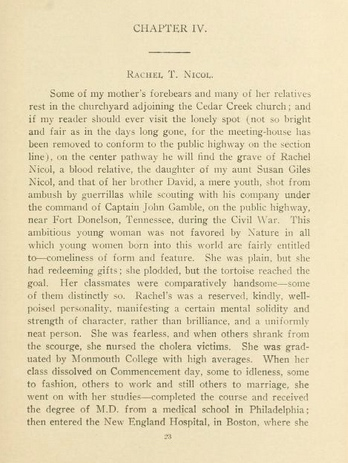 The chapter of the book is "Rachel T. Nicol", however, in personal letters Rachel signs her name "Rachel Jane Nicol". Further controversy arouse when Rachel began attending Monmouth College. At the time, she preferred to be called "Jennie", and therefore appears as Jennie on some official documents. In the chapter on Rachel, her cousin writes "She was plain, but had redeeming gifts...Rachel's was a reserved, kindly, well-poised personality, manifesting a certain mental solidity and strength in character, rather than brilliance...". Matthew H. Jamison was born in September 10, 1840 in Henderson County, most likely close to Little York, IL. Later in life, he became an establish military man holding positions such as Lieutenant and Commander. 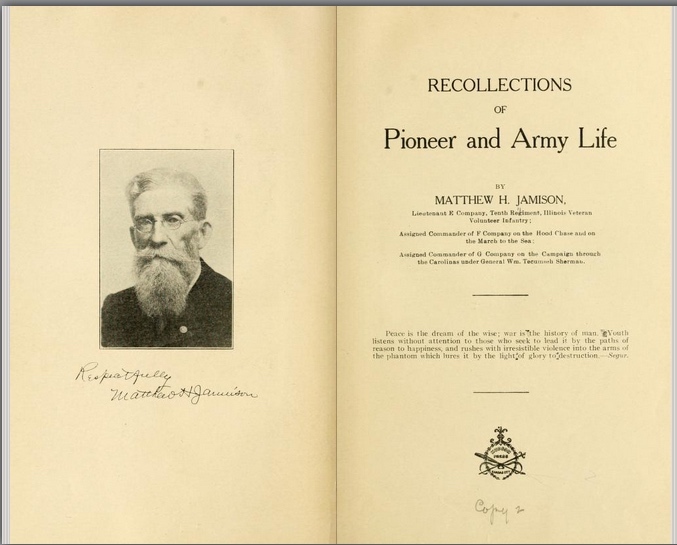 Jamison wrote a book Recollection of Pioneer and Army Life in which he talks about his life from early childhood throughout his time in the military. 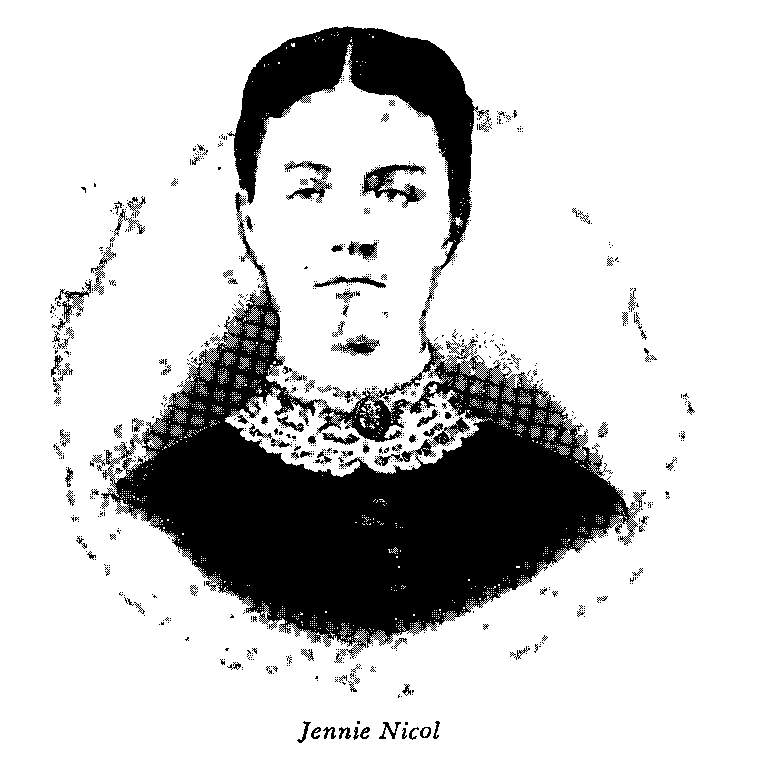 This image of Jennie Nicol is used in most documents and books where she is mentioned. It appears to be one of very few official pictures of Jennie. Jennie's cousin wrote a chapter describing her childhood and her personality along with a summary of her success in life. At the end of the chapter he states that Jennie was he mother's favorite niece. Matthew M. Jamison discusses Jenni Nicol and their relationship. Later on in this chapter he has printed many of the letters that she had sent while on her journeys in Boston and Zurich.